A few dear friends recently gave me a gorgeous sampler box of tea from Bellocq. It's as if they read my mind, as I've been meaning to check out their Brooklyn Atelier for months. It's right near one of our favorite pizza places, but a visit has just not timed out properly. Hungry children usually don't have much interest in tea shops. I'll need to take a solo venture there one of these days. ﻿ ﻿Everything about the brand is artistic yet simple. The website is absolutely gorgeous. The designers have a great eye. Their teas are also beautifully packaged. Just looking at the silver and yellow canisters makes me want to collect as many as possible. Purchasing teas in the canister is expensive, but perhaps an occasional indulgence. The sampler box I have is quite sturdy and stands out with its bright yellow color. It's a particularly grey day here in NYC (it feels like I say that a lot) so the box truly brightened up my world. I cannot wait to visit the Atelier, I imagine it to be a full sensory experience. 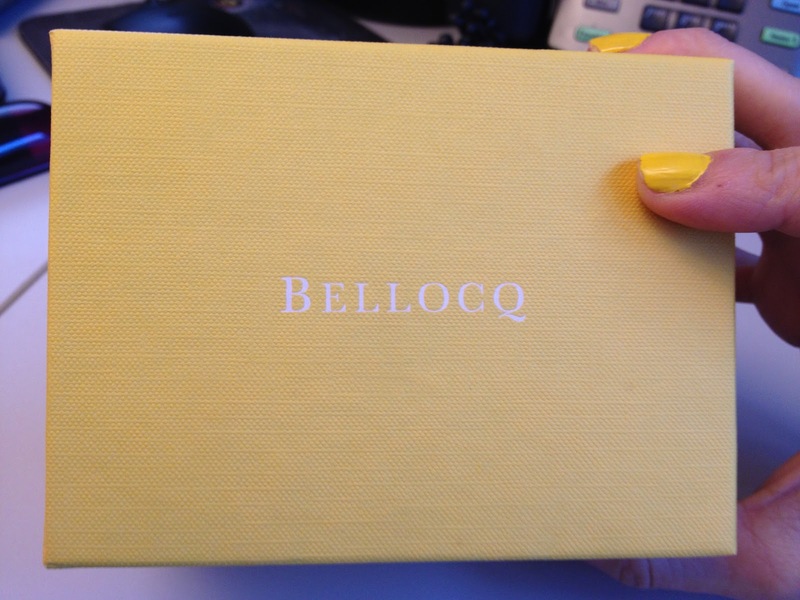 My yellow nails match the box! ﻿My friends chose well, selecting a box of 'pure teas' as I don't usually prefer blends. I like the little added touches in the packaging- they include paper infuser bags for the teas, and also provide a detailed steeping chart for each tea. Nicely done. ﻿﻿﻿ I've been sipping each tea in the sampler, and they are all tasty and of good quality. I decided to focus a post on just the No. 11 White Peony. The dry leaves are an attractive mixture of cut leaves and downy buds. The mixture smells sweet and floral which is usually my experience with this type of tea. I'm always amazed that no matter how sweet the White Peony leaves smell, the sweetness never transfers to the aroma of the brew. The tea has a dried grass/hay-like smell, and is very earthy. I did slightly over steep my tea, but it still tastes smooth and delicious. Sweet, rich, yet delicate. An earthy taste of the dried grass with a slightly mellow vegetal finish. Refreshing and invigorating. It would make a nice iced tea in the hot weather as well. After trying these sample teas, I am even more excited to visit the Brooklyn store. One question I have though...how do you pronounce their name? Is it bello-C-Q or something else? If anyone knows, please share!! Thank a huge thank you to my friends that gave me such a lovely gift! I also would be at a complete loss as to how to pronounce this name. Bellocq is such an unusual name! I can't think of any other name ending in "cq" like that. I was a bit surprised that their website's about page not only does not mention pronunciation, but does not give any explanation about the name.